From the time we get the details of your specific use case to providing a customized Big Data solution, you can literally count the days on your fingers. And you will see us do this repeatedly for every Big Data use case - that's our promise to you. ​▪ by leveraging Amazon Web Services' elastic and secured cloud infrastructure - trusted by businesses worldwide. ​The fees for using this solution (that's true - for 'using' and not for 'building' the solution) will be a fraction of what a typical Big Data project costs. Our pricing model is unique in the Big Data solutions space and offers you an unprecedented value with no risk! And you can be rest assured that as your data grows, our cloud-based Big Data solution will elastically scale to meet that increasing demand and continue to deliver consistent performance and results critical to supporting your business needs. Benefit from ClearFunnel's incredible price-performance value and pay only for using the final, tested solution. De-risk your business from the costs of building Big Data solutions which don't work. ​Ever wished to see your Big Data solution up and running within days and weeks (instead of months and years)? Buckle-up and see your results delivered blazing fast with ClearFunnel. ClearFunnel's Big Data solutions deliver the optimum benefits of speed, scalability, and price. ​Looking to seamlessly transform your Big Data assets to actionable insights or to infuse adrenaline into your data analytics? Achieve all these and more with ClearFunnel. ​It is most likely that in your experience too, you have seen similar expressions as businesses struggle to implement Big Data solutions. With ever-expanding data assets becoming fundamental to business successes, it is becoming even harder to get those Big Data solutions in a reasonable time and cost. 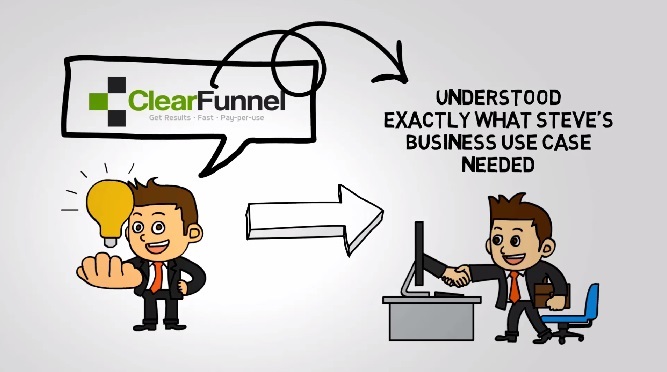 ClearFunnel was founded to address exactly that need. We use Amazon's secured cloud infrastructure and our IPs in the Big Data arena to deliver customized solutions for your business needs. With ClearFunnel's end-to-end Big Data solution offering that assures results in days and weeks (YES!) and not in months and years, you don't have to master Big Data technology, hire niche-skilled talent, and spend hundreds of thousands of Dollars to turn your data assets into results that your business needs. And to top it all, you only pay when you actually start using the solution, and not to build, test, and deploy it. We are sure you will be amazed at the speed and the incredible price of getting your Big Data solutions from ClearFunnel. Get started to see the results for yourself!